Turkey's President Recep Tayyip Erdogan speaks in Mersin, southern Turkey, on March 10, 2018. Turkey’s parliament passed a law revamping electoral regulations on Tuesday, backing legislation the opposition said could open the door to fraud and jeopardize the fairness of 2019 polls, and triggering a brawl on the floor of the chamber. The passage of the law grants Turkey’s High Electoral Board the authority to merge electoral districts and move ballot boxes to other districts. Ballots that aren’t stamped by the local electoral board will still be admissible - formally approving a practice that caused a widespread outcry from government critics and concern from election monitors at a referendum last year. Security force members will be allowed into polling stations when invited by a voter, a measure the government says is designed to prevent intimidation by the outlawed Kurdistan Workers Party (PKK) in the mainly Kurdish southeast. Opposition parties, however, see the measures as making the vote counting process less transparent and as allowing the government to move ballot boxes from opposition strongholds. “The battle in parliament is over but we will fight for election security by every means. We will go to the constitutional court regarding the unconstitutional nature of this regulation,” said Ozgur Ozel, a deputy from the main opposition Republican People’s Party (CHP). 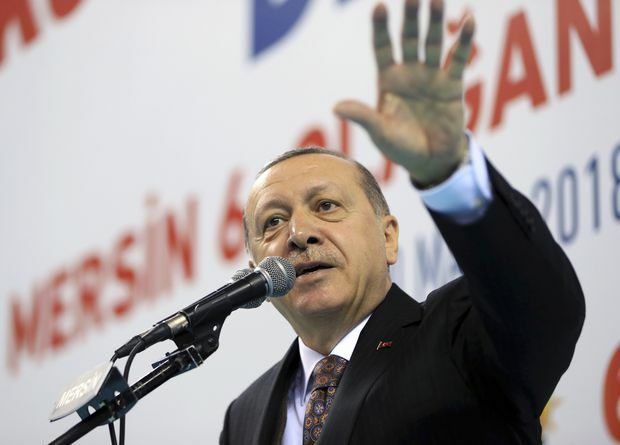 The legislation formally allows for the creation of electoral alliances, paving the way for a tie-up between President Tayyip Erdogan’s ruling AK Party and their nationalist allies. It was widely expected to pass, given the combined support of the AKP and the nationalist MHP. After Deputy Speaker Aysenur Bahcekapili announced the voting result, a brawl erupted between nationalist lawmakers and those from the main opposition. Several parliamentarians traded punches and shoved and chased each other in the chamber. The government has said some of the measures, such as allowing security force members into polling stations, were needed to counter what it says is widespread voter intimidation by the PKK in the mainly Kurdish southeast. The government accuses the pro-Kurdish Peoples’ Democratic Party (HDP) of being an extension of the PKK and says it benefits from voter intimidation. The HDP denies this. The PKK, considered a terrorist group by the United States and Europe, has waged a three-decade insurgency against the Turkish state. Turks go to the polls next year for presidential and parliamentary elections. Last year they backed, by a 51.4 percent margin, a referendum to create an executive presidency with sweeping new powers for Erdogan. That vote was marred by a last-minute decision by the High Electoral Board to accept unstamped ballots. The Office for Democratic Institutions and Human Rights (ODIHR), a Europe-based election monitor, said the move “removed an important safeguard”. The HDP described the new law as a legitimization of election crimes.